Here you will find my portrait drawings, animals, landscapes and more. Click on any image below to see a larger view and for details about the artwork. gothic/fantasy art, animals and landscapes. paintings and anything else I've created in colour. Alternative versions of my original drawings. These have been digitally coloured and enhanced using paint editing software. done using paint editing software. As well as now being in full colour there are a few differences that have been added compared to the original version. 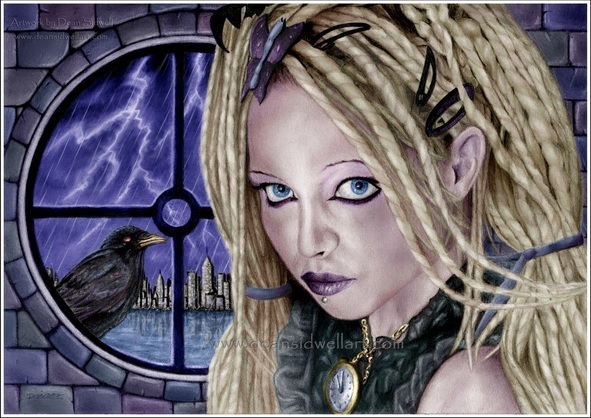 Stormbringer: A woman in front of a round window, there's a crow on the window ledge outside. In the background, across a stretch of water, there's a cityscape. There's lightning in the night sky. You can see the original black & white pencil drawing at the top of the page. Some quick drawings that I have done. These are not as detailed as my other drawings because they were drawn in a short space of time. In the Works In Progress Gallery I will keep you updated with all the latest projects that I am working on. It is also where you can see work in progress pictures of my earlier drawings. So, if you are interested in seeing my drawing process, this is the place to look.